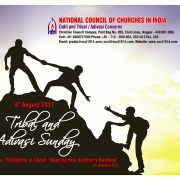 Among all the NCCI Regional Centenary Celebrations the Tamilnadu Region has got a real taste and rich experience of Grass-roots Ecumenism. 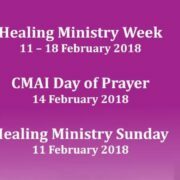 The Celebration had Three events such as a Day Ecumenical Seminar, a Public Meeting and the observation of the International Prayer Day for Peace. Over 700 Clergies, Church Leaders, Nuns, Full Time Mission Workers, Theological Educators and Students, Lay Leaders, Women and Youth participated from 16 districts o Tamilnadu including, Chennai, Thiruvannamalai, Velore, Madurai, Dindigul, Theni, Trichy, Tanjavur, Selem, Coimbatore, Ramnad, Virudhunagar, Sivaganga, Trinelveli, Tuticorin and Kanyakumari. The theme for the Seminar was ‘Christian Contribution towards Societal Transformation aiming to recollect the stories and legacies of the yester generational missionaries and how we will carry the same in our ministries today ecumenically. There were three major presentations from Catholic, Reformed and Pentecostal backgrounds by Fr. Dr. Jeevaraj, Rev. Dr. M. Ganavaram and Rev. Paul Radhakrishnan. All these presentations were citing stories and incidents how the yester generations Christianity transformed our societies through their mission as a commitment to the Gospel of risen Christ. These presentations illuminated and inspired the participants to look at the mission differently and beyond church and to the society at large. Rev. Christopher Rajkumar, Executive Secretary – NCCI and Rev. Asir Ebenezer, CSI-Synod have jointly facilitated a session on ‘Need for Grassroots Ecumenism Today’. Earlier, Rev. Dr. Arthur Jeyakumar a renowned historian gave a bird’s eye view of the NCCI and its mission and ministries from the grass-roots ecumenism perspective. Rev. Dr. Roger Gaikwad, the General Secretary of the NCCI was the key note speaker. He noted that, the Mission of God is supposed to be transform the entire society politically and socially and just not mere personally and individually. Rev. Dr. Mar Atsongchanger, the Vice President brought the greetings from the NCCI, the ABAM and NEICC. He encouraged the participants to be together in faith, spirit and ministry. Rt. Rev. Dr. Taranath S Sagar, the President – NCCI in his presidential address said, in today’s Indian context, the Grass-roots ecumenism in inevitable both theologically and politically. Therefore we all need to be united always for the sake of Christ and the Gospel. The Seminar was inaugurated by the Rt. Rev. 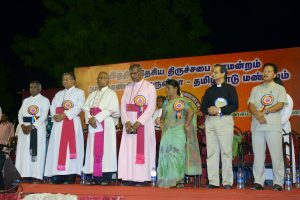 Dr. M Jospeh, CSI Bishop in Madurai. Bishop Joseph recited the prayer of Jesus ‘that all of they may be one’ and called every christian to join in Christ and Jesus wished for. He called all to join the envisioning mission of Jesus. Fr. Arul welcomed the participants and Ms. Proposed the vote of thanks. Fr. 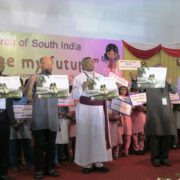 Dr. Joseph Selvaraj, Vicar General of Madurai Arch Diocese and Dr. Esther Kathiroli were the other speakers. This is the first time in the history of the NCCI Centenary Celebrations the Pentecostals and Front Line Church Leaders share dais with the Catholics and NCCI Members Churches said, Bishop Dr. Taranath S Sagar. 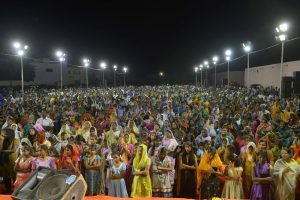 Over 10000 Christians Gathered in Madurai to thanks God for the NCCI and to Pray for all the NCCI Members Churches, Organizations, CBCI, EFI and All the Christian Churches and Christians in India. The public meeting was held at the Church of South India grounds in K Pudur Madurai. Most Rev. Dr. Antony Posusamy, Arch Bishop, Madurai Arch Diocese presided over the public meeting and shared the love and greetings from the Catholic Fraternity. Bishop Antony also suggested to continue this fellowship even after the celebration and this fellowship should live forever he said. Pastor. Dr. J J Y Arul, the Vice-president of the National Pentecostal Synod represented all the Front Line Churches and greeted the gathering with the plea suggesting the NCCI to consider to include all the Christian to be part of the NCCI Family irrespective of their theology and traditions and NCCI should become the face of the Indian Christians. Bishop. Taranath S Sagar described how the 2.5 Christians in India serve the rest 97.5 percent. Further he said, the Christian community called to serve the larger society by the united and common service, witness and fellowship to transform the societies though our ministries. It is not how big our churches are in containing several thousand people but how our hearts in Christ are accepting others are important. Rev. Dr. Roger Gaikwad shared about the present ministries of the NCCI and explained how important to be together in Christ for the society not for ourselves. He further challenged the participants and the church leaders by ignoring our spiritual differences for the sake of the Gospel and being together in prayer and fellowships at the grass-roots level locally as much as we can. It is not who would be on the Right side of God but rather how closer to God through such fellowships are important. Dr. Mar Atsongchanger called all the church leaders and the participants to say ‘YES’ to ecumenism. Ecumenism is a gift of God let us not ignore this rich gift by keeping ourselves away. Let us not forget our ancestors who became Christians several years back and their suffering to bear witness to Christ. With the same commitment let us have one identity as Christians. It is correct theologically, spiritually and politically he said. Rev. Paul Radhakrishina, President – IMA, Rev. Dr. Aruldoss Gnanamuthu, Founder Director Lamb’s Institute of Mission and Evangelism, Pastors. Jeyaraj, Daniel, Jacob, Zachariah and Eva. Alan Paul have spoken on the occasion. Fr. Arul, Fr. Pannerselvam, Rev. Sr. Amala Rani, Rev. Dr. M. Gnanavaram were the other speakers in the public meeting. Bishop. Dr. Joseph (CSI) expressed his desire and suggested to continue this fellowship annually to celebrate the unity of Churches and Christians. And he called all the Church leaders to be part of this fellowship. The CSI Diocese of Madurai Ramnad, The Catholic Arch Diocese, the Pentecostal Pastors Fellowships joining all the Churches and Christian Institutions organized this mega event. Rev. Christopher Rajkumar mooted the public meeting resolutions including demanding the States to ensure the freedom to preach our faith, demand to abolish state discrimination against the converted Dalits in ensuring the SC status, removing the restriction over constructions of our worshiping places, affirm the rights and dignity of the minorities and to control the right wing fundamental forces who promote hate campaigns against each other faiths and communities, these demands which were unanimously resolved and the TNCC and the TNBC have jointly forwarded the same to the State and Central Governments. Dr. Esther Kathiroli, welcomed the gathering and Rev. Dr. G K Chellappa proposed the vote of thanks. Bishop Dr. Antony Popusamy offered a closing prayer and the benediction. On the 21st September over 2000 congregations observed the International Prayer day for Peace and offered special prayers for Gaza (Palestine) , Sri Lanka, Kashmir and other such conflict Zones.